The Inspector is in his fifties, dressed in a plain dark suit. He initially seems to be an ordinary Brumley police inspector, but (as his name suggests) comes to seem something more ominous, perhaps even supernatural. J. B. Priestly writes The Inspector "need not be a big man, but he creates at once an impression of massiveness, solidity and purposefulness." The precise nature of his character is left ambiguous by Priestly, and it can be interpreted in various ways. The Inspector knows is aware that Sheila feels guilty, and had underlined that before she realised, and lets her feel guilty and admit she cannot bare to be responsible for the girl's death. She is struck by the truth of what the Inspector says, showing that he is a powerful, manipulative and interesting character. Priestley describes him as speaking "carefully, weightily ... and [he] has a disconcerting habit of looking hard at the person he addresses before he speaks." Inspector Goole questions the Birlings (Mr Birling , Mrs Birling , Eric Birling, Sheila Birling) and Gerald Croft. He is Priestley’s voice – he represents Priestley's strong moral views. His job is to make the characters change their attitudes, face up to what they have done and start taking responsibility for each other – see his final message in the play. He heightens drama – his entrances and exits are well timed in order to create maximum tension (e.g. at the end of Act 1 when he walks in on Gerald and Sheila’s conversation). He controls the structure of the play – each revelation moves the play one step forward. Inspector Goole's character doesn't change. He always remains assertive throughout the play. However, he seems to gain more control over the characters as the play progresses. ​​Scroll down for a list of his quotes. Or read ahead for (very!) important quote analysis. He arrives at a critical time – to interrupt Mr Birling and his selfish views: ‘a man has to mind his own business and look after himself and his own – and – We hear the sharp ring of a front doorbell.’ The Inspector’s role is to show that this is not the case. The Inspector uses the pronoun 'we' wheras Mr Birling and Mrs Birling use 'I'. Priestley creates a division between the Birlings selfish desires and Priestley's own message of collective responsibility. 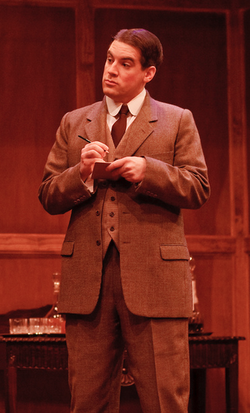 He is described in the stage directions as giving ‘an impression of massiveness, solidity and purposefulness’. He takes charge immediately from Mr Birling and remains in control throughout. Mr Birling attempts to regain control, but fails as the Inspector quickly regains his control (The Inspector interrupts Birling ‘cutting through, massively’). Goole remains solid as each of them breaks down and nothing distracts him from his purpose. He is clearly there to challenge and investigate. He has a habit of ‘looking hard’ at the person he is interrogating before starting to speak. This unnerves the characters. He directs the investigation carefully, dealing with ‘one line of enquiry at a time’. Therefore, he is controlling the structure of the play. He is a teacher – to teach each character (and the audience) of the importance of social responsibility. Goole might have made a reference to the Bible in his statement "We are members of one body". His assertion suggests a moral character, with Biblical characteristics of compassion and love. “A chain of events” lead to Eva Smith's suicide.